Whether your child is a bookworm or doesn’t enjoy English at all, knowing what they’re learning in school means you can give them extra support at home. Here’s your guide to what they’re being taught as part of the Year 5 English curriculum. Children should be allowed to choose a book at school to take home with them to read. You may be given an exercise book in order to write your comments in when you read with them. As part of guided reading, children will read with their teacher in groups once a week. Practise key skills at home with our range of Year 5 English worksheets, which cover grammar, punctuation and writing for purpose. 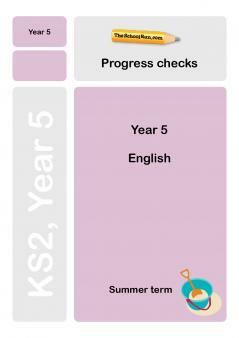 Check your Y5 child's progress in English with our free Y5 English Progress checks, three mini-tests for the autumn, spring and summer terms.